In May 2013, Thermoscan carried out a thermography inspection for a major facility in Brisbane. During the inspection a contactor in an electrical switchboard was identified as operating above “normal” temperature and showed signs of potential failure. The item was nominated in our Inspection Report as a Priority 1. The customer was notified immediately whilst on site and advised it was our recommendation that the contactor required immediate attention. 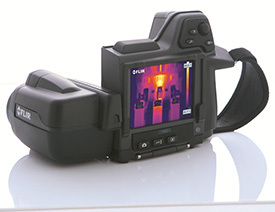 As an “Independent” thermographer, our role is to carry out thorough thermal inspections, identify any potential issues and offer our recommendations. We can only provide guidance, because we do not have authority to enforce the recommendations nominated. In this case, carrying out our recommendation was unfortunately delayed a number of months, but luckily the repair was undertaken before any catastrophic event occurred. 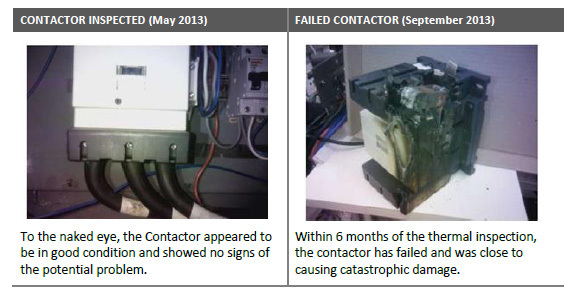 As visible in the photo below, the contactor was in the process of disintegrating. If left any longer, it no doubt would have caused extensive damage to the switchboard or more seriously, the facility. It may have also caused potential downtime, loss of property or life!